The past is full of surprises. Part of the joy of reading Lynch’s Ferry is finding out new and sometimes startling information about historical events that have taken place right here, in our own backyard. Part of the pleasure, too, is meeting the researchers who comb Central Virginia’s archives and landscapes, uncovering fresh facts about people, resources, and enterprises that have helped to shape this corner of Virginia. Back in the summer of 2006, the Lynchburg and Legacy museums, Jones Memorial Library, and Martin Luther King Center invited Dr. Charles B. Dew to speak at the Lynchburg Public Library. His lecture, “Asking Large Questions in Small Places: The Slave Ironworkers of Buffalo Forge and Oxford Furnace, Virginia” attracted a large, attentive audience. Dew has a substantial fan club in Central Virginia. If you are not currently a member, you will be soon. This issue of Lynch’s Ferry features one of his first essays, a seminal study published in 1974 revealing the dignity, ingenuity, and courage of Campbell County’s highly skilled slave force. Though this magazine does not normally condense and reprint articles, Dew’s appeal as both a scholar and a storyteller—not to mention how well his research meshes with our mission to explore the region’s cultural heritage—required making an exception. More recently, author Heidi James has been poring over old maps, letters, and annual reports at City Hall and the Jones Memorial library, asking questions about a small place called Riverside Park. Her main interest in the park’s history, however, has more to do with the future than the past. As Riverside stands “poised for a comeback,” James is eager to revisit and perhaps revive elements of the park’s glory days. Compiled to assist Lynchburg citizens and others involved in the decision-making process, James’s comprehensive history stands on its own in this issue as a wonderful contribution to our understanding of the city’s ever-changing physical and cultural landscape. Speaking of change: It’s time to talk about the elephant in the room or what might better be described as the crane-like creature in the room. I’m talking about John Randolph, the man whose name Randolph-Macon Woman’s College selected to mark its transition to a coed institution. With each passing day, the selection seems more appropriate. Randolph drew fire—literally—in his own time and apparently he is still at it, provoking controversy and instigating quarrels from beyond the grave. 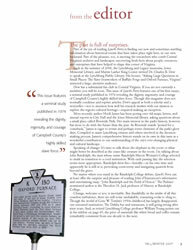 No matter where you stand in the Randolph College debate, Lynch’s Ferry can at least offer the surprise and pleasure of reading John d’Entremont’s informative and entertaining essay, “John Randolph and the Field of Honor.” The Pulitzer-nominated author is the Theodore H. Jack professor of History at Randolph College. Change, welcome or not, is inevitable. But thankfully, in the midst of all this ceaseless turbulence, there are still some unshakable, reassuring rocks to cling to. Though the world of Gene W. Tomlin’s 1950s childhood has largely disappeared, one esteemed institution, The Dahlia bar and restaurant, is still going strong after sixty years. And, as retired Lynchburg College professor William Young points out in his sidebar on page 45, the price of essentials like white bread and coffee remain remarkably consistent from one decade to the next.